"Seventh Fleet" redirects here. For other uses, see Seventh Fleet (disambiguation). The Seventh Fleet is a numbered fleet (a military formation) of the United States Navy. It is headquartered at U.S. Fleet Activities Yokosuka, in Yokosuka, Kanagawa Prefecture, Japan. It is part of the United States Pacific Fleet. At present, it is the largest of the forward-deployed U.S. fleets, with 60 to 70 ships, 300 aircraft and 40,000 Navy and Marine Corps personnel. Its principal responsibilities are to provide joint command in natural disaster or military operations and operational command of all naval forces in the region. The Seventh Fleet was formed on 15 March 1943 in Brisbane, Australia, during the World War II, under the command of Admiral Arthur S. "Chips" Carpender. It served in the South West Pacific Area (SWPA) under General Douglas MacArthur. The Seventh Fleet commander also served as commander of Allied naval forces in the SWPA. Most of the ships of the Royal Australian Navy were also part of the fleet from 1943 to 1945 as part of Task Force 74 (formerly the Anzac Squadron). The Seventh Fleet—under Admiral Thomas C. Kinkaid—formed a large part of the Allied forces at the Battle of Leyte Gulf, the largest naval battle in history, in October 1944. The Seventh Fleet fought in two of the Battle Leyte Gulf′s main actions, the Battle of Surigao Strait and the Battle off Samar. USS Gambier Bay (CVE-73) and escorts at the Battle off Samar in October 1944. After the end of the war, the 7th Fleet moved its headquarters to Qingdao, China. 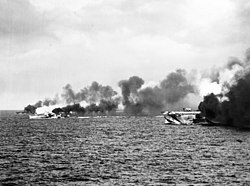 As laid out in Operation Plan 13–45 of 26 August 1945, Kinkaid established five major task forces to manage operations in the Western Pacific: Task Force 71, the North China Force with 75 ships; Task Force 72, the Fast Carrier Force, directed to provide air cover to the Marines going ashore and discourage with dramatic aerial flyovers any Communist forces that might oppose the operation; Task Force 73, the Yangtze Patrol Force with another 75 combatants; Task Force 74, the South China Force, ordered to protect the transportation of Japanese and Chinese Nationalist troops from that region; and Task Force 78, the Amphibious Force, charged with the movement of the III Marine Amphibious Corps to China. After the war, on 1 January 1947, the Fleet's name was changed to Naval Forces Western Pacific. In late 1948, the Fleet moved its principal base of operations to the Philippines, where the Navy, following the war, had developed new facilities at Subic Bay and an airfield at Sangley Point. Peacetime operations of the Seventh Fleet were under the control of Commander in Chief Pacific Fleet, Admiral Arthur W. Radford, but standing orders provided that, when operating in Japanese waters or in the event of an emergency, control would pass to Commander, Naval Forces Far East, a component of General Douglas MacArthur's occupation force. On 19 August 1949 the force was designated as United States Seventh Task Fleet. On 11 February 1950, just prior to the outbreak of the Korean War, the force assumed the name United States Seventh Fleet, which it holds today. Seventh Fleet units participated in all major operations of the Korean and Vietnamese Wars. The first Navy jet aircraft used in combat was launched from a Task Force 77 (TF 77) aircraft carrier on 3 July 1950. The landings at Inchon, Korea were conducted by Seventh Fleet amphibious ships. The battleships Iowa, New Jersey, Missouri and Wisconsin all served as flagships for Commander, U.S. Seventh Fleet during the Korean War. During the Korean War, the Seventh Fleet consisted of Task Force 70, a maritime patrol force provided by Fleet Air Wing One and Fleet Air Wing Six, Task Force 72, the Formosa Patrol, Task Force 77, and Task Force 79, a service support squadron. Over the next decade the Seventh Fleet responded to numerous crisis situations including contingency operations conducted in Laos in 1959 and Thailand in 1962. During September 1959, in the autumn of 1960, and again in January 1961, the Seventh Fleet deployed multiship carrier task forces into the South China Sea. Although the Pathet Lao and North Vietnamese supporting forces withdrew in each crisis, in the spring of 1961 their offensive appeared on the verge of overwhelming the pro-American Royal Lao Army. Once again the fleet moved into Southeast Asian waters. By the end of April 1961, most of the Seventh Fleet was deployed off the Indochinese Peninsula preparing to initiate operations into Laos. The force consisted of the Coral Sea and Midway carrier battle groups, antisubmarine support carrier Kearsarge, one helicopter carrier, three groups of amphibious ships, two submarines, and three Marine battalion landing teams. At the same time, shorebased air patrol squadrons and another three Marine battalion landing teams stood ready in Okinawa and the Philippines to support the afloat force. Although the administration of President John F. Kennedy already had decided against American intervention to rescue the Laotian government, Communist forces halted their advance and agreed to negotiations. The contending Laotian factions concluded a cease-fire on 8 May 1961, but it lasted only a year. In June 1963 the Seventh Fleet held 'Flagpole '63,' a joint naval exercise with the Republic of Korea. Seventh Fleet represented the first official entrance of the United States into the Vietnam War, with the Gulf of Tonkin incident. Between 1950 and 1970, the U.S. Seventh Fleet was known by the tongue-in-cheek nickname "Tonkin Gulf Yacht Club" since most of the fleet's operations were conducted from the Tonkin Gulf at the time. On 12 February 1965, USS Salisbury Sound (AV-13) became the first U.S. Navy ship to conduct operations inside Vietnam coastal waters. Salisbury Sound set up a seadrome in Da Nang Bay and conducted seaplane patrols in support of Operation Flaming Dart, the bombing of North Vietnamese army camps. Task Force 73 included the fleet's logistics support vessels operating as an underway replenishment group (URG) containing an oiler, an ammunition ship, and other supply tenders. Task Force 75, Surface Combatant Force, contained the fleet's surface combatants and naval gunfire support. These units formed the gun line to bombard enemy forces during Operation Sea Dragon, Operation Custom Tailor, and Operation Lion's Den. The Royal Australian Navy contributed a series of guided missile destroyers to the gun line, including Hobart, Perth, Brisbane, and Vendetta. The naval gun line concept was made possible with deep waters for larger vessels well away from both the shoals and enemy coastal artillery. Task Group 70.8, a cruiser-destroyer subset of the task force, began shelling Vietnam on 27 May 1965. The cruisers and destroyers mostly used 5-inch and 8-inch guns while USS New Jersey opened fire with her 16-inch guns. Task Force 76 was the Amphibious Force, Seventh Fleet. Marines went ashore at Da Nang in March 1965 and patrolled throughout the I Corps area of responsibility during operations Starlite, Dagger Thrust, Double Eagle, and Jackstay. Task Force 77 was the Carrier Battle Force, Seventh Fleet. It would participate in striking North Vietnamese targets, providing air support to US forces in South Vietnam, and mining Hiaphong Harbor. Task Force 78 was the fleet's minesweeper support. After the 1973 cease-fire, it was responsible for Operation End Sweep, removing naval mines dropped in Haiphong harbor only months earlier. Task Forces 116 and 117 were brown-water riverine forces involved in the interdiction efforts Operation Market Time, Operation Game Warden, and Operation Sealords. In 1975, ships and aircraft of the Fleet evacuated thousands of U.S. citizens and refugees from South Vietnam and Cambodia as those countries fell to opposing forces. Since the end of the Vietnam War, the Seventh Fleet has participated in a joint/combined exercise called Team Spirit, conducted with the Republic of Korea armed forces. With capability to respond to any contingency, Fleet operations are credited with maintaining security during the Asian Games of 1986 and the Seoul Olympics of 1988. During 1989, Seventh Fleet units participated in a variety of exercises called PACEX, the largest peacetime exercises since World War II. A carrier task force of the Seventh Fleet, Task Force 74 (TF 74), entered the Bay of Bengal at the height of the war in December 1971. It never had a very clear mission. TF 74 comprised the nuclear-powered aircraft carrier Enterprise; the amphibious assault carrier Tripoli; the destroyers Decatur, McKean, and Orleck; the guided-missile escorts Waddell, King, and Parsons; the nuclear-powered attack submarine Gurnard; and supply ship Wichita. On 15 December, a day before the surrender of Pakistan to Indian Army, the task force entered the Bay of Bengal, at a distance of some 1,760 km (950 nmi; 1,090 mi) from Dhaka. The Soviet Union also dispatched the 10th Operative Battle Group of its Pacific Fleet under the command of Admiral Vladimir Kruglyakov in Vladivostok to the area. George Washington, Squadron HC-1 during operation "Desert Shield" in 1990, U.S. Seventh Fleet. Of the 50–60 ships typically assigned to Seventh Fleet, 18 operate from U.S. facilities in Japan and Guam. These forward-deployed units represent the heart of Seventh Fleet, and the centerpieces of American forward presence in Asia. They are 17 steaming days closer to locations in Asia than their counterparts based in the continental United States. It would take three to five times the number of rotationally-based ships in the U.S. to equal the same presence and crisis response capability as these 18 forward deployed ships. On any given day, about 50% of Seventh Fleet forces are deployed at sea throughout the area of responsibility. It was reported on 10 May 2012 that USS Freedom (LCS-1) would be dispatched to Singapore in the northern spring of 2013 for a roughly 10-month deployment. On 2 June 2012 the U.S. and Singaporean Defense Ministers announced that Singapore has agreed 'in principle' to the US request 'to forward deploy up to four littoral combat ships to Singapore on a rotational basis.' Officials stressed however that vessels will not be permanently based there and their crews will live aboard during ship visits. On 21 August 2017, while on a routine visit to Singapore, Arleigh Burke-class destroyer USS John S. McCain (DDG-56) was involved in a collision with merchant vessel Alnic MC off the coast of Singapore, east of the Strait of Malacca. The incident left 10 Navy sailors missing and five injured. The US Navy announced that Commander of the Seventh Fleet Vice Adm. Joseph Aucoin had been dismissed and replaced by Vice Adm. Phillip G. Sawyer, who had already been nominated and confirmed to replace the retiring Aucoin. The Seventh Fleet is organized into specialized task forces. George Washington was flagship of Task Force 70 of the U.S. Seventh Fleet before 2017. Task Force 70 – TF 70 is the Battle Force of 7th Fleet and is made up of two distinct components: Surface Combatant Force 7th Fleet, composed of cruisers and destroyers, and Carrier Strike Force 7th Fleet, made up of at least one aircraft carrier and its embarked air wing. The Battle Force is currently centered around Carrier Strike Group Five, the carrier USS Ronald Reagan (CVN-76) responsible for unit-level training, integrated training, and material readiness for the group's ships and aviation squadrons. As the only continuously forward deployed carrier strike group, the CSG-5 staff does not stand down when the strike group is in Yokosuka, but instead continues to maintain command responsibilities over deploying Carrier Strike Groups and independently deployed cruisers, destroyers, and frigates that operate in the Seventh Fleet operating area. The commander and staff are also responsible for the higher level Task Force 70 duties throughout the year in addition to the CSG-5 duties. The composition of the strike group in immediate proximity of Ronald Reagan varies throughout the year. The CSG 5 Commander also serves as Battle Force Seventh Fleet and Commander, Task Force (CTF 70) for 7th Fleet. In these responsibilities, CSG 5 serves as the Commander of all surface forces (carrier strike groups, independently deploying cruisers, destroyers and frigates) in the 7th Fleet area of responsibility. CTF 70 also serves as the Theater Surface Warfare Commander (TSUWC) and Theater Integrated Air Missile Defense Commander (TIAMDC) for Seventh Fleet. During the Korean War, Captain Charles L. Melson was the commanding officer of the flagship of the Seventh Fleet, the battleship USS New Jersey (BB-62) from 20 October 1952. He also served during that time as Commander, Task Group 70.1. Task Force 71 – TF 71 includes all Naval Special Warfare (NSW) units and Explosive Ordnance Disposal Mobile Units (EODMU) assigned to 7th Fleet. It is based in Guam. Task Force 71 was based in Fremantle, Western Australia in 1941–42, operating submarines under Rear Admiral Charles A. Lockwood. He was relieved by Rear Admiral Ralph W. Christie on 7 March 1943. During the first half of 1965, the Seventh Fleet operationally controlled the Vietnam Patrol Force (Task Force 71), the American component of the Operation Market Time effort. The Naval Advisory Group, headquartered in Saigon, served as the liaison between the fleet, Commander U.S. Military Assistance Command, Vietnam, and the South Vietnamese Navy. On 31 July 1965, formal control of the U.S. Operation Market Time force passed from the Seventh Fleet to the Naval Advisory Group, which in turn activated the Coastal Surveillance Force (Task Force 115). The fleet continued to provide logistic and administrative support. The command function was further refined on 1 April 1966 when Naval Forces, Vietnam, was established, relieving the Naval Advisory Group of responsibility for Market Time operations. Task Force 71 operated the Search and Rescue/Salvage Operations for Korean Air Lines Flight 007 shot down by the Soviets off Sakhalin Island on 1 September 1983. On the day of the shootdown, Rear Admiral William A. Cockell, Commander, Task Force 71, and a skeleton staff, taken by helicopter from Japan, embarked in USS Badger (stationed off Vladivostok at time of the flight) on 9 September for further transfer to the destroyer Elliot to assume duties as Officer in Tactical Command (OTC) of the Search and Rescue (SAR) effort. Surface search began immediately and on into the 13-day of September. U.S. underwater operations began on 14 September. No longer any hope of finding survivors, on 10 September 1983, Task Force 71 mission had been reclassified "Search and Salvage" operation from a "Search and Rescue". On 17 October 1983, Rear Admiral William Cockell was relieved of command of the Task Force and its Search and Salvage mission, and Rear Admiral Walter T. Piotti, Jr., was placed in command. There were three U.S. search and salvage ships involved—the Coast Guard cutter USCGC Munro, the rescue salvage ship USS Conserver, and the Fleet Tug USNS Narragansett. There were also three Japanese tugs chartered through the U.S. Navy's Far East Salvage Contractor (Selco), these were the Ocean Bull, the Kaiko-Maru 7, and the Kaiko-Maru 3. Aside from these vessels, there were the U.S. naval combatants and logistical support ships. These were USS Elliot, USS Badger, USS Sterett, USNS Hassayampa, USS Callaghan, USS Brooke, USS Meyerkord, USS Towers, USS Stark and USS Wichita. In addition to the above ships, there were numerous Japanese Maritime Safety Agency patrol boats and South Korean vessels involved. Task Force 71 also used to fulfill the function of Command and Coordination Force, Seventh Fleet. The Seventh Fleet Command Ship is USS Blue Ridge, based at U.S. Fleet Activities Yokosuka, Yokosuka, Japan. In 2004, Blue Ridge entered dry dock and the responsibility was transferred temporarily to USS Coronado. Blue Ridge returned to duty 27 September 2004. Task Force 72 – TF 72 is the Patrol and Reconnaissance Force, Seventh Fleet. It is located at Naval Air Facility Misawa (Misawa Air Base), Japan. It is mainly composed of anti-submarine warfare (ASW) aircraft and maritime airborne surveillance platforms such as P-3 Orion and Lockheed EP-3 reconnaissance planes operating on land bases. Toward the end of the Korean War, Commander Task Force 72 transferred his flag to USS Pine Island on 7 March and detachments of VP-42 also left USS Salisbury Sound for that seaplane tender. That same day Task Force Seventy-Two was established as the Formosa Patrol Force under Rear Admiral Williamson in Pine Island. Task Force 73/Commander, Logistics Group Western Pacific – 7th Fleet's Logistics Force composed of supply ships and other fleet support vessels. Headquartered in Singapore. Task Force 74 – TF 74 was the designation used for the Enterprise battle group in 1971. Today, it is the Fleet Submarine Force responsible for planning and coordinating submarine operations within 7th Fleet's area of operations. Task Force 75 – Navy Expeditionary Forces Command Pacific is 7th Fleet's primary Expeditionary task force. Located in Camp Covington, Guam, CTF 75 is responsible for the planning and execution of coastal riverine operations, explosive ordnance disposal, diving, engineering and construction, and underwater construction throughout the 7th Fleet area of responsibility. Task Force 76 – Amphibious assault task force currently headquartered at U.S. Fleet Activities Sasebo, mainly responsible for supporting Marine landing operations. It is composed of units capable of delivering ship-to-shore assault troops, such as Tarawa-class and Wasp-class amphibious assault ships, and landing craft. Task Force 77 – 7th Fleet Mine Warfare Force composed of mine countermeasure, mine hunter, and mine control ships as well as mine countermeasure helicopters (MH-53). This task force is only activated during specific combat operations and was filled by the Commander of Mine Warfare Command. Mine Warfare Command has now been disestablished and replaced by Navy Mine and Antisubmarine Warfare Command, Naval Base Point Loma, Calif. Task Force 78 – In 1973, Task Force 78 served as the mine clearance force that cleared Haiphong Harbour in Operation End Sweep. Major elements of the U.S. Navy mine warfare force, including Mobile Mine Command (MOMCOM), Mine Warfare Support Group (MWFSG), and HM-12 were airlifted by C-5A to NAS Cubi Point in the Philippines. These specialists formed the nucleus of Task Force 78, under the command of Rear Admiral Brian McCauley, for Operation End Sweep. Commander, Mine Force, U.S. Atlantic Fleet had reported to Vice Admiral James L. Holloway III, Commander, Seventh Fleet, in September 1972 as Commander Task Force 78. TF 78 was officially activated in November 1972. However, it became clear more helicopters were needed. Responding to a Navy request for assistance, Commanding General, Fleet Marine Force Pacific (CG FMFPAC) directed that HMH-463 deploy from MCAS Kaneohe Bay, Hawaii, to NAS Cubi Point, to join Task Force 78. On 27 November 1972, with the efficient support of Col. Bill Crocker's MAG-24, HM-463 embarked at Pearl Harbor aboard USS Inchon, which was en route from Norfolk to augment Seventh Fleet Amphibious Forces and to participate in End Sweep. As of 2010, Commander Naval Forces Korea, an administrative liaison unit between USFK, the ROK Navy, and Seventh Fleet, has been assigned the TF 78 designation. Naval Forces Korea is headquartered at Yongsan and has a base at Chinhae, Commander Fleet Activities Chinhae. Task Force 79 – The Marine expeditionary unit or Landing Force assigned to the fleet, consisting of at least a reinforced Marine battalion and its equipment. This unit is separate from the Marine Expeditionary Unit (MEU) normally embarked in USS Bonhomme Richard Amphibious Readiness Group (ARG). Marine units serving in 7th Fleet are normally drawn from III Marine Expeditionary Force based in Okinawa, Japan. Carrier Strike Group Five: USS Ronald Reagan (CVN-76), USS Antietam (CG-54) and USS Shiloh (CG-67). USS City of Corpus Christi (SSN-705), a forward-deployed nuclear submarine of the 7th Fleet. Destroyer Squadron 15: USS Curtis Wilbur (DDG-54), USS John S. McCain (DDG-56), USS Fitzgerald (DDG-62), USS Stethem (DDG-63), USS Benfold (DDG 65), USS McCampbell (DDG-85) and USS Mustin (DDG-89). The USS Blue Ridge, flagship, U.S. Seventh Fleet. The Commander of the 7th Fleet is known as COMSEVENTHFLT. ^ "U.S. 7th Fleet forces". U.S. Navy, 7th Fleet. 2014. Archived from the original on 8 October 2014. Retrieved 24 September 2014. ^ "Records of U.S. Seventh Fleet Public Affairs". Naval History & Heritage Command. 29 April 2005. Archived from the original on 2 October 2013. Retrieved 24 September 2014. ^ Marolda, Edward J. (8 November 1997). "By Sea, Air, and Land". Naval History & Heritage Command. Retrieved 22 April 2017. ^ Willis, Warren (2009). "USS Bexar APA-237". oldbluejacket.com. Retrieved 24 September 2014. ^ Melson, Charles D.; Arnold, Curtis G. (1991). The War That Would Not End, 1971–1973. U.S. Marines in Vietnam. United States Marine Corps History and Museums Division. p. 188. LCCN 77604776. ^ "Narrative History of the USS Enterprise (CVA(N)65) 1 Jan – 31 Dec 66" (PDF). United States Navy. 10 July 1967: 1. Archived from the original (PDF) on 13 January 2012. The presence of USS Enterprise in the Gulf of Tonkin was well-known around the world by January 1966. Her own prestige as the largest and most powerful warship of the fleet had followed her to Yankee and Dixie Station, and there was more to the emerging legend than this; she and USS Bainbridge, her frigate "smallboy", had put a watershed date in naval history merely by being the first nuclear-powered ships to engage in combat. Their unmatched speed, detection systems, and operational capacity potential were proving their worth far beyond the original estimates during the first weeks "on the line at the Tonki Gulf Yacht Club." ^ "History of the USS Salisbury Sound (AV-13)". USS Salisbury Sound (AV-13). USS Salisbury Sound Association. Retrieved 19 January 2015. ^ Cavendish 1989, p. 11. ^ Holloway, James L. "Tactical Command and Control of Carrier Operations". Naval Historical Foundation. Archived from the original on 2004-05-30. ^ "Vietnam War: Afloat and Ashore: Operation Sea Dragon". Naval Historical Foundation. ^ Holloway, James (15 January 2011). Aircraft Carriers at War: A Personal Retrospective of Korea, Vietnam, and the Soviet Confrontation. Naval Institute Press. p. 296. ISBN 978-1-61251-008-8. ^ Cavendish 1989, pp. 29,46–49. ^ Perryman, John (10 August 2006). "Towing the line". Navy. 49 (14). ^ Bonsall, George (1997). "The Impact of Advanced Naval Surface Fire Support on Joint Force Fire Coordination". Federation of American Scientists. Retrieved 24 September 2014. ^ "U.S. warships begin bombardment of Viet Cong targets – 27 May 1965". This Day in History. 2014. Archived from the original on 5 July 2014. Retrieved 24 September 2014. ^ Cavendish 1989, pp. 42–45. ^ Cavendish 1989, pp. 24–40. ^ Cavendish 1989, pp. 61. ^ Cavendish 1989, pp. 50–59. ^ Simha, Rakesh Krishnan (31 August 2013). "Sweeping mines, salvaging looted gold after the 1971 War". Russia & India Report. Archived from the original on 29 June 2015. Retrieved 24 September 2014. ^ Wolf, Jim (10 May 2012). 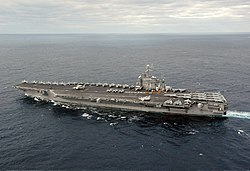 "U.S. plans 10-month warship deployment to Singapore". Reuters. Retrieved 24 September 2014. ^ "US sailors to stay off-shore in Singapore deal: officials". AsiaOne. 2 June 2012. Retrieved 24 September 2014. ^ "USS John McCain collides with merchant ship east of Singapore, 10 sailors missing, US Navy says". ABC News (Australia). 21 August 2017. Retrieved 24 August 2017. ^ Smith, Alexander; Flanagan, Ed (21 August 2017). "U.S. Destroyer Collides With Tanker Off Singapore; 10 Missing". NBC News. Retrieved 24 August 2017. ^ McKirdy, Euan; Lendon, Brad (23 August 2017). "US Navy 7th Fleet commander dismissed, Navy says". CNN. Retrieved 24 August 2017. ^ Slavin, Erik (17 May 2017). "Sawyer nominated to head Yokosuka-based 7th Fleet". Stars and Stripes. Retrieved 24 August 2017. ^ "Carrier Strike Group Five". Navy Data. U.S. Navy Outlets. 2013. Archived from the original on 3 November 2013. Retrieved 30 December 2011. ^ "The Carrier Strike Group". Navy Data. U.S. Navy. 2013. Retrieved 1 November 2013. ^ Morison, Samuel Eliot (1947–1962). History of U.S. Naval Operations in World War II, Vol. VI: Breaking the Bismarcks Barrier, 22 July 1942 – 1 May 1944. Little, Brown and Company. p. 68. ^ Johnson, R.W. (1985). Shootdown: Flight 007 and the American Connection. New York: Viking. p. 194. ISBN 9780670812097. ^ Pearson, David (1987). KAL 007: the Cover-up. New York: Summit Books. pp. 237, 239. ISBN 978-0671557164. ^ Polmar, Norman (2005). Naval Institute Guide to the Ships and Aircraft of the U.S. Fleet (18th ed.). p. 37. ISBN 978-1591146858. ^ "Korean War Naval Chronology, May–July 1953". Naval History & Heritage Command. 2012. Archived from the original on 4 December 2013. Retrieved 24 September 2014. ^ Holloway III, James L. (2007). Aircraft carriers at war. Naval Institute Press. p. 328. ISBN 978-1-59114-391-8. Note that Admiral Holloway appears to have made a mistake with the identification of the CH-53M squadron referred to on page 327. The squadron referred to appears to have been HM-12. ^ Van Nortwick, John. "Operation End Sweep". Marine Corps Gazette (May 1974). Archived from the original on 13 November 2013. Retrieved 24 September 2014. ^ Holloway III, James L. (2007). Aircraft carriers at war. Naval Institute Press. p. 329. ISBN 978-1-59114-391-8. ^ "Home". www.c7f.navy.mil. Archived from the original on 2017-11-29. Retrieved 2017-11-29. ^ Lubold, Gordon (22 August 2017). "U.S. Navy Relieves Admiral of Command After Collisions". The Wall Street Journal. Retrieved 24 August 2017. ^ "Commander, U.S. 7th Fleet, Vice Adm. Phillip G. Sawyer". US Navy. Retrieved 24 August 2017. The Vietnam War:War at Sea. New York: Marshall Cavendish. 1989. ISBN 0863078648. Marolda, Edward J. (2011). Ready Seapower: A History of the U.S. Seventh Fleet. Washington, DC: Naval History & Heritage Command, Department of the Navy. ISBN 9780945274674. Marolda, Edward J. (1994). By Sea, Air, and Land: An Illustrated History of the U.S. Navy and the War in Southeast Asia. Washington, DC: Naval Historical Center. ISBN 0160359384. Archived from the original on 1998-07-03. 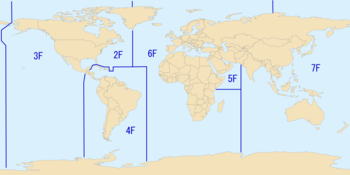 Wikimedia Commons has media related to United States Seventh Fleet. This page was last edited on 16 April 2019, at 05:22 (UTC).